Yield response to applied nitrogen (N) in lower rainfall areas is often relatively low and may also reduce oil. This, along with the cost of N and the current payment structure for high oil canola, results in uncertain economic returns from N fertilisation in low-medium rainfall areas. A conservative approach to applying N is recommended. Farmers should plan to apply N to canola within the first eight weeks, however delaying topup N until 12 weeks after sowing, when the canola crop is near flowering, is a viable option in low and medium rainfall areas. The area of canola (Brassica napus L.) sown in the grain growing regions of Western Australia has expanded from 106 000 hectares in 1997 to 1.16 million hectares in 2013. During this time period the area sown has expanded by six-fold in high rainfall (>450mm annual rainfall) regions, 13-fold in medium rainfall (350-450mm) regions, and 19-fold in low rainfall (<350mm) regions. In 2013, 81% of the canola area in WA was in low (19%, 226 000ha) and medium (62%, 717 000ha) rainfall regions. While the area of canola sown in WA is extensive, seed yields are inherently low. During the period 1997-2013, the average canola yield in WA was 1.1t/ha with yields in the low rainfall area averaging approximately 70% of the state’s average. Despite these low yields farmers persist with canola due to both the high relative grain price and the break crop value it provides for their cropping systems. While persisting with canola at these low yield levels, farmers seek to reduce their financial risk. One way to reduce risk is to reduce inputs. Some inputs such as weed and insect control are often mandatory, while fertiliser inputs, particularly nitrogen (N) are often considered optional and at a cost of $1-1.50/kg, N is a major input cost. Throughout the world canola is reputed to have a high requirement for N, while in south-western WA the amount of N required for maximum seed yield production is usually more N than that supplied by soil. Therefore fertiliser N is often used to optimise the growth of canola and maximise seed yield. However adequate to high levels of fertiliser N have been shown to decrease oil concentration in the seed of canola. Therefore it is important to match N inputs to anticipated yield levels and avoid reducing the concentration of oil in the seed. Canola responds to fertiliser N at a wide range of growth stages, for example, previous work in Victoria showed that canola produced similar results when N was applied either at sowing or at early flowering bud stage. The capacity of canola to respond to late-applied N may allow growers to reduce their financial risk by delaying decisions on inputs until they have a good assessment of the yield potential of their crop, and if the seasonal outlook is poor, perhaps reduce inputs. To assist WA farmers in low and medium rainfall areas making decisions on N inputs we conducted a number of experiments to assess the response of canola to N and to determine if the timing of N could be delayed in WA until later in the growing season. Assess the response of canola to N and to determine if the timing of N could be delayed in WA until later in the growing season. Fifteen N experiments were conducted over three years from 2012 to 2014 in the low to medium rainfall zones in south-west Western Australia. Split plot design – Main plots – herbicide group, sub plots – varieties x N rates/timings, 3-4 replicates. In 2012, the cultivars tested were CB Telfer (triazine tolerant (TT) open pollinated (OP), very early maturity), CB Tanami (TT OP, early maturity), CB Junee HT (TT hybrid, early maturity), GT Cobra (Roundup Ready® (RR) OP, early-mid maturity), Hyola 404RR (RR hybrid, early-early mid maturity), and Pioneer 43Y23RR (RR hybrid early maturity). 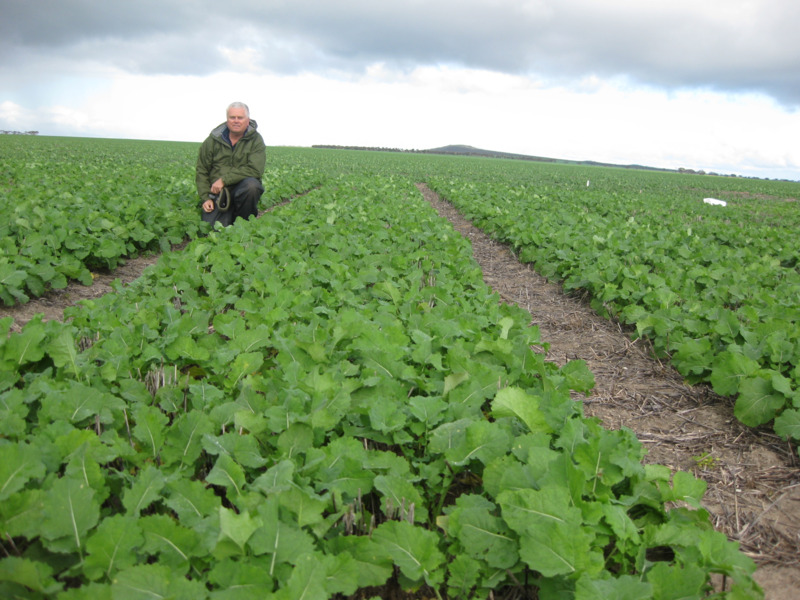 In 2013 Hyola 404RR and ATR Stingray (TT OP, early-mid maturity) were compared at medium rainfall sites, and Hyola 404RR and CB Telfer were compared at low rainfall sites. In 2014. 43Y23RR and Sturt TT (TT OP, early – mid maturity) were tested at all sites. Figure 1 Seed yield, oil concentration in seed and oil yield response of canola varieties to applied nitrogen at Grass Patch in 2012. Vertical bars indicate l.s.d. at P = 0.05. Figure 3 Seed yield, oil concentration in seed and oil yield response of triazine tolerant open pollinated (TT OP) and RoundupReady (RR) hybrid canola to applied nitrogen at five sites in 2013 where maximum applied N was 150 kg/ha. Vertical bars indicate l.s.d. at P = 0.05. Figure 4 Seed yield, oil concentration in seed and oil yield response of triazine tolerant open pollinated (TT OP) and RoundupReady (RR) hybrid canola to applied nitrogen at five sites in 2014. Vertical bars indicate l.s.d. at P = 0.05. Figure 5.c Figure 5: Responses to single and split applications of nitrogen in 2013 low rainfall experiments where highest rate was 100 kg N/ha (METanalysis of Holt Rock, Merredin, Salmon Gums and West Dalwallinu). (a) Seed yield, (b) oil concentration in seed and (c) gross margin. Legend indicates timing of split applications of N. WAS = weeks after sowing. Vertical bars indicate l.s.d. at P = 0.05. Figure 6: Responses of (a) seed yield, (b) oil concentration in seed and (c) gross margin to split applications of nitrogen in 2013 medium rainfall experiments where highest rate was 150 kg N/ha (METanalysis of Cunderdin, Eradu, Katanning, Wittenoom Hills and Wongan Hills)). Legend indicates timing of split applications of N. WAS = weeks after sowing. Vertical bars indicate l.s.d. at P =0.05. Figure 7: Seed yield and concentration of oil in seed in relation to rate and time of nitrogen application in 2014 (METanalysis of Chapman, Cunderdin, Ogilvie, Salmon Gums and Wongan Hills). Vertical bars indicate l.s.d. at P = 0.05. On average, RR hybrid produced 250kg/ha or 23% more seed and 2.2% more oil than TT OP canola, and the average gross margin of RR hybrid was $65/ha more than TT OP. However, seed yield and gross margin differences between RR hybrid and TT OP canola were reduced when seed yields were below 1400kg/ha. Canola growth (dry matter) and seed yield responded positively to N fertiliser in most experiments, with 90% of maximum seed yield achieved at an average of 46kg N/ha. However 90% of maximum gross margin was achieved at a lower average nitrogen rate of 17kg N/ha, due primarily to the relatively small yield increase compared to the reduction in the concentration of oil in the seed with applied N.
As canola growers of south-western Australia are now paid an uncapped premium for canola grain with oil concentration above 42%, decreases in oil% have a significant financial effect and recommended rates of N should be lower than those calculated to optimise seed yield. In 80% of cases, the first 10kg N/ha applied provided a return on investment in N greater than $1.50 for every $1 invested. The next 20kg N/ha applied provided a return on investment of $1.25 for every $1 invested in N 80% of the time, and further increases would most likely breakeven. The timing of nitrogen application had a minor effect on yield, oil and financial returns but delaying N application would allow farmers to reduce risk under poor conditions by reducing or eliminating further inputs. Overall our work demonstrates that a conservative approach to N supply that is mindful of the combined impacts of N on yield and oil is necessary in south-western Australia and that split and delayed applications are a viable risk-management strategy. This trial is one of a series conducted throughout WA as part of the GRDC/DPIRD co-funded project Tactical Break Crop Agronomy in Western Australia. Nitrogen responses of canola in low to medium rainfall environments of Western Australia (2016) Seymour Mark, Sprigg Sally, French Bob, Bucat Jackie, Malik Raj, Harries Martin. Crop and Pasture Science 67, 450-466.